Nabs, the support organisation for the advertising and media industries, has launched a new brand identity created by the charity's creative agency Fold7. The rebrand includes a new logo and tagline, "How’s work? ", which is intended to open a dialogue between Nabs and people in the industry and reflect its mission to support, improve and champion the wellbeing of employees and employers. Nabs president Karen Blackett said: "Through two simple words, ‘How’s work?’, Nabs challenges us all to reflect on the direction in which we are going. "Whatever the answer to the question, their focus on building resilience and confidence, career guidance and advice, and heartfelt support can help us all stay on course." Fold7 chief executive Marc Nohr added: "Opening up about how we can all be better supported at work is fundamental to cultivating a healthy industry culture." The brand relaunch comes at a time when the role the charity plays is shifting with the changing face of the world of work. In the first half of 2017, emotional support overtook financial assistance as the top reason that people contacted Nabs’ advice line. Over a quarter (28%) of the 1,400 calls made to the line were for emotional support, compared to 25% for financial assistance, and 16% from people facing redundancy. 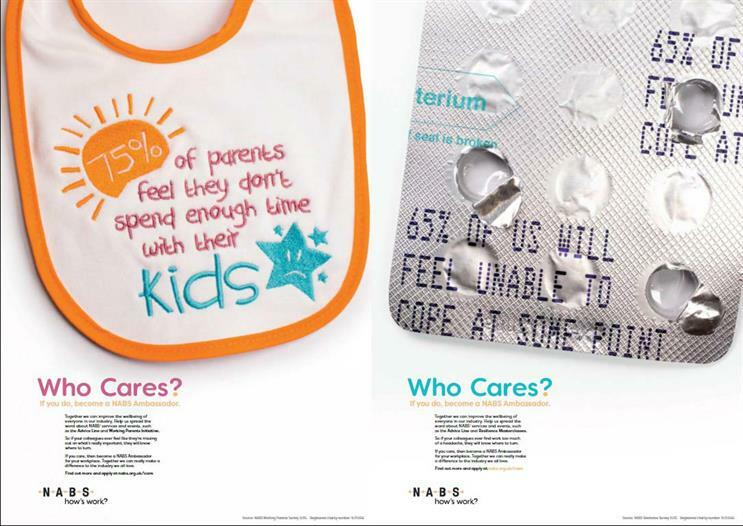 The new identity is being unveiled as part of Nabs’ new "Ambassadors" campaign, which also launches today around the tagline, "Who cares?" The recruitment campaign will highlight issues around stress and resilience and challenge people concerned about their colleagues’ wellbeing to become Nabs ambassadors. Nabs chief executive Diana Tickell said: "Our ‘Who cares?’ campaign aims to provoke a response from those who want to address issues around workplace wellbeing. "We want to find the people in our industry who share our ambitions of creating a happier, healthier more productive workforce and want to play an active role in improving work life for them, their colleagues and the industry at large."